The art of formulating school and community active transportation related policy includes: asking questions to frame community issues, building community commitment through engagement, understanding how to work within local and regional transportation planning systems and providing clear direction to staff and committees to develop and steward an action plan. How Ready is Your Community to Collaborate on a Safe Routes to School Project? Go through these steps to assess your community’s readiness to engage in safe routes to schools or other active transportation projects. These questions will also help you identify areas that need to be developed and ways to prioritize investments in order to have long lasting and successful projects. What’s a Mayor to Do? Read the story of a small city mayor taking action when faced with dangerous walking & bicycling conditions for students & community members. 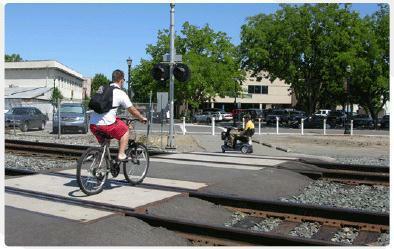 One way to influence change is to model active transportation behaviors. Here are a few examples of civic leaders doing just that.